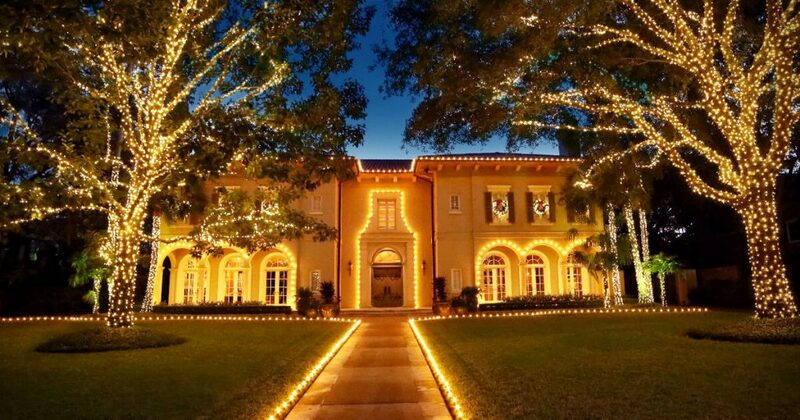 Ignite Christmas Lighting offers premier residential Christmas lighting and decorating services to homeowners across the Houston area. Our professional interior and exterior lighting and decorating services capture the spirit of the holiday season and enhance your property to its fullest potential. Stand out in your neighborhood with beautiful Christmas lighting and décor from Ignite Christmas Lighting. Avoid treacherous ladders, tangled up Christmas lights, and family arguments this holiday season with our exterior holiday lighting and decorating services. Ignite Christmas Lighting provides custom design, installation, maintenance, and removal of Christmas lights for our residential clients. To begin, we meet with our clients to determine the vision for the space and create a custom lighting plan to bring that vision to life. We utilize various types of Christmas lighting, including roofline, landscape, and tree lighting, to transform your home into a winter wonderland. Once the design has been approved, we provide efficient installation of the Christmas lights. We offer a full warranty on the holiday lights, so if you need any replacement bulbs or repairs during the season, our team is on-call to repair or replace the lights at no additional cost. After January 1st, we remove the holiday lights and store the usable lights, again at no additional cost. Bring the holiday magic indoors with the interior lighting and decorating services of Ignite Christmas Lighting. Whether you prefer a bold statement or have a more minimalist approach to décor, our team designs festive displays that capture the essence of the season while tailored to your tastes. From Christmas tree décor to garlands and wreaths and beyond, our decorations make a lasting impression. Our full-service approach to interior decorating includes custom design, installation, maintenance, and removal of holiday lighting and décor. Give yourself the gift of our interior lighting and decorating services this holiday season. Our residential packages start at $2,000.